We've so far found the launch okay, but EA is working on a fix if you're less lucky. Update: EA says it's been fixed. 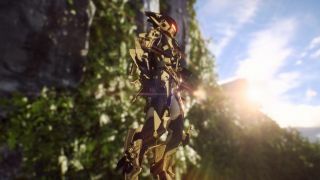 Original story: EA has acknowledged that some players are having issues connecting to Anthem's servers, and says it's working on a fix as quickly as possible. The game went live for Origin Access Premier users about an hour ago—while I personally encountered one brief server error screen, since then I've logged in and out twice as a test without any issues. Likewise, none of my PC Gamer colleagues—who were already logged into the game—have had any trouble. So it's hard to tell how widespread these issues are. We'll update this post when EA provides an update on the issue, and we'll be playing and writing about Anthem all weekend. Keep an eye on Anthem's server status here. Maybe, by the end of Sunday, I'll understand what the Anthem of Creation actually is. James has written about Anthem's improved flight control options with a mouse and keyboard, while Tom has detailed all of Anthem's microtransactions so far.